I continue to analyze the data gathered in my first field season studying Northern Goshawks in the Sawtooth National Forest as a part of my Masters program in Raptor Biology. This is a continuation of my first post on the analysis process. I actually received requests from MULTIPLE people asking me to continue blogging on the analysis phase of my project. So, hold on tight and stick with me, I will try to make this as painless as possible! First nest discovered with nestlings! In the first post, I illustrated using straight-forward confidence intervals that avian abundance was a significant predictor for goshawk nest occupancy and success. Here I will highlight another more sophisticated approach to arrive at a very similar answer. Then I will discuss the problem with these two approaches and why these are no longer valid for this particular case and l talk a little bit about where I will be taking it from here. In the previous post I introduced the concept of AIC based model selection. I mentioned that in ecological studies it is now a foundational expectation for data analysis. Here I will illustrate analyzing nest occupancy and success using AIC model selection. The first step is to hypothesize which variables should be predictors for nest occupancy and success. An important constraint is that you need to limit the number of possible explanatory variables, based on the sample size. There are different rules of thumb, but one is that you must have 10 samples for each variable, some say five. I am going to stretch this a bit and try three variables for 24 samples. I predict that Avian prey abundance and Mammalian prey abundance, are significant predictors. I also want to include the percent of the territory in sagebrush habitat (versus forested habitat) as I believe that has affected my abundance measurements. The first step is to ensure that none of the predictor variables are overly correlated. For this I will set a threshold for the correlation coefficient greater than 0.70. Graph of relationships with correlation coefficients. The graph indicates a low amount of correlation between the predictor variables (0.24, -0.29, 0.34). This was a surprise as I expected the mammalian abundance to be highly correlated to the amount of sagebrush habitat (seemed that we saw more mammals in open habitat). But, low correlation coefficients are good. I have then calculated the AIC values (actually AICc values which are AIC values adjusted for small sample size) for each of the eight combinations of these three variables as predictors for nest success, including the null model (no predictor). There are ranked based on the lowest AICc values. 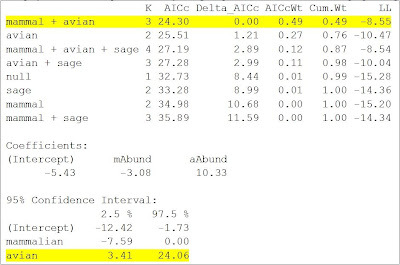 This analysis indicates that the model using mammalian abundance and avian abundance best explains the data, although the model using only avian abundance is very close (within 2 AICc can be assumed roughly equivalent). There are various approaches to moving forward from here: 1. Use the top model; 2. "Model Average" those within 2 AICc; 3. "Model Average" those within 4 AICc; 4. "Model Average" all eight models. Some have even recommended model averaging within 10 AICc. Here I will simply take the top model, create coefficient estimates, and 95% confidence intervals for the coefficients. If the confidence intervals do not include 0, then we can assume that predictor to have a significant influence. From this we can take away that a model of both Mammalian prey abundance and Avian prey abundance best predicts nest occupancy and success, and that the influence of Avian prey abundance is significant (confidence interval does not overlap with zero). Hmm, that was the same answer as the previous analysis! But, there is a problem with both of these analyses. They both have an issue of "False Negatives". In these analyses, I had 8 successful nests and 16 failed or unoccupied nests. The issue is that I don't know for sure that there was not a successful nest in one of the 16 territories that we failed to discover. The "No Nest Detected" territories could have one of three values: 1. There was no occupied nest there; 2. There was a nest there but it failed before we detected it; 3. There was a nest there and it was successful, but we failed to detect it. Of course, this last category is very troublesome. For large conspicuous creatures, you might assume this probability is very, very low. For goshawks it is not low. We have walked right under nests without seeing them. We know this as we discovered it later. Rosenstock et al. (2002) analyzed 224 papers published in nine different journals between 1989 and 1998 and found that only 13% of these studies acknowledged and addressed the case of false negative detections. The bar for publication is clearly higher today. The solution to this issue is to include the detection probability into the analysis. Essentially, instead of saying a territory is "not occupied", we say the territory has a X% probability of being occupied and successful. The whole statistical approach changes. The challenge is determining whether the detection probability is constant, what it is, and what it depends upon. There are a number of ways to generate this, which I am still investigating. At a minimum I will use the values provided by Woodbridge and Hargis (2006), who have analyzed the discovery method I utilized in the field and determined it has a 90% detection rate. I should say that having used the methodology in the field, I believe that they are being quite optimistic! That's it for now. Thanks for sticking with me. More to come. I welcome your feedback. This last year, Karyn and I read a book titled, "The Wolverine Way". This amazing book provides some great insight into the behavior of this very elusive creature that most of us will never see in the wild. It also highlights some of the conditions which the researchers must face to study an animal which spends its life in the very high rugged terrain which is not very hospitable to humans. Any time I am having a bad day in the field, I think of what these guys had to face on a daily basis and that helps to reset my expectations. I highly recommend this book for research, wildlife lovers, or anyone who just appreciates a good story. Sunrise on the East side of Glacier National Park. The Highline trail is one of the most popular trails in the park for serious hikers and those. The trails is relatively easy if taken from Logan Pass to the Loop, where you can catch a park shuttle back to the top. This path is 11.5 miles, only gains 800 feet, but drops close to 3000 feet. However, the 0.75 mile side trip up to the Grinnell Glacier Overlook is strenuous, but HIGHLY recommended. With the side trip it finishes at about 13 miles. The trip is spectacular with amazing vistas and great wildlife - goats, sheep, eagles, marmots, etc. It is clearly my favorite trail in the park. Early in Highline Trail Hike. Going-to-the-sun road is visible below. Beargrass looking back toward start of Highline Trail. Karyn at Grinnell Glacier Overlook. Many of the trails were closed due to bear activity. On our hike into Trout Lake we were turned around after meeting a couple that had just had a very close aggressive encounter with a Grizzly Bear with a cub. They were actually charged by the female. Ptarmigan Tunnel, Iceberg Lake and Grinnell Glacier trails were also closed. From Many Glacier only two of the longer day hikes was available - Cracker Lake and Swiftcurrent Pass. We chose the pass. Swiftcurrent Pass trail heads up from Many Glacier, past a number of lakes and crosses over Swiftcurrent Pass just above the Granite Chalet (on the Highline Trail). Thus, we would end up less than a mile from where we had been a few days before. The trail was once again filled with wildlife including our own bear encounter, although this one was a black bear at about 100 yards. We easily slipped by and continued on our way. The trail passes a few lakes before hitting the head of the canyon and turning into switchbacks. Each switchback provided a new more amazing view until we made it to the summit at 6.8 miles. This trail was an out and back so we were able to enjoy the views again on the way back down along with answering everyone's questions about how much further it was to the top. Quite a few people were headed up behind us as this was one of the few trails still open. Head of Swiftcurrent Canyon. Where is that wolverine??? View from where we came (started the day 5 lakes down valley). On the final day in the park we enjoyed the short trail from the top of Logan Pass, opposite the Highline Trail, which heads into Hidden Lake. The early morning lighting provided fantastic scenery and up-close encounters with wildlife. Hidden Lake from Hidden Lake Overlook. While the wolverine remained elusive, we did see lots of other wildlife. Here is a sampling from the week. A Golden Eagle amazed us on the Highline Trail as it pursued Ground Squirrels and Hoary Marmots. As multiple species alarm calls echoed across this landscape this guy flew in and dove toward the prey, but came up with empty talons. It isn't often you get to watch raptors from above! Golden Eagle approaching prey on Highline trail. Golden Eagle coming around for a second chance (Highline Trail). It's fun to watch people in the parking lots look through binoculars at mountain goats a mile away. Just a short distance down a trail and you sometimes have to leave the trail to get around them. On the highline Trail we came face to face with a mountain goat. It was clear he had no intention of leaving the trail. We stepped to the outside, but he would not pass. I realized this would box him in. We stepped to the inside and he marched right on by, almost brushing up against us. Mountain Goat demanding the trail (Highline Trail). Mountain Goat sleeping ON Hidden Lake Overlook platform. Bighorn Sheep aren't quite as conspicuous, but we still saw them on many occasions. Bighorn Sheep (Hidden Lake Trail). One of my favorite animals, is the Hoary Marmot. These large rodents really show their personality when you watch them. They are also an important prey species for the Wolverine! We found them at the higher elevations on most of the trails we hiked. A number of juveniles were out and about as well. Juvenile Hoary Marmot (Hidden Lake Trail). I was hoping to see White-tailed Ptarmigans, but they too remained elusive. Of course, we weren't allowed to hike the Ptarmigan Tunnel trail, I am sure we would have found them there! On the Swiftcurrent Pass hike we did find three families of Dusky Grouse (right near the bear). It was an amazing trip with the Highline Trail hike being the favorite. I highly recommend it and can't wait to go back to this amazing place. Time off - time to head back into the woods! Mount McGown on northern tip of Sawtooth Mountains. One of many elk herds we saw - most with healthy calves. The Stanley area is a great area for nesting Sandhill Cranes. We would see approximately 20 pairs, many with colts, some with two. Sandhill Cranes, Elk, Canada Geese. One day we took the boat across Redfish Lake to hike into the central Sawtooths. We had hoped to go to Saddleback Lakes, but the water was very high and we could not find a safe crossing. We headed to Alpine Lake instead (in Redfish drainage, there are two other Alpine Lakes in the Sawtooths!). While there I noticed tracks heading straight up the snow field behind the lake. Could they be wolverine tracks? Path of potential wolverine tracks outlined in red. The pronghorn are doing well. More than half of the herd are calves. There must have been a lot of twins in this group this year. Stanley has quite a few beaver colonies. We like to explore these for birds and other wildlife. The dam has been destroyed in our favorite area and hasn't been repaired for two years. The beavers must be gone. The result is that the bird numbers are also down in that area. This year we found a few new areas to explore. Northern Goshawk food! - Red Tree Squirrel. On the final day of our trip we moved our campsite out to Bear Valley to look for wolves and to float Bear Valley Creek in the morning. We were surrounded by elk all night, but did not hear a single howl. It's a crime against wildlife that we have removed this predator from this fabulous ecosystem. From our van we could see a dozen Sandhill cranes, three elk herds, deer, a family of Northern Harriers, Osprey, etc. It's a beautiful location. In the morning we launched our inflatable kayak for the journey down the river. It takes about two hours and is spectacular. In May, the journal of the Coopers' Ornithological Society - The Condor, published my research on avian migration. I have the full pdf of the article which I am able to distribute upon request. If you are interested in reading it, send me a message or comment on this post. It is also available via jstor if you have institutional access or are a Coopers member. It should also be on the Idaho Bird Observatory site sometime soon. Miller, R. A., J. D. Carlisle, and G. S. Kaltenecker. 2011. “Effects of regional cold fronts and localized weather phenomena on autumn migration of raptors and landbirds in southwest Idaho.” Condor 113 (2): 274-283. Male goshawk delivers a baby bird to his nestling. With the female absent he appears not to know how to feed the nestling. The nestling tries to eat, then the male takes the food away. Note: the female usually feeds the nestling and it is common to take uneaten food out of the nest. The food is usually cached nearby.